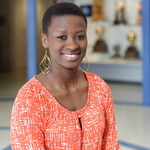 Jessica Wamala graduated from Villanova University in May 2013 with majors in Political Science, Arab and Islamic studies, and Global Interdisciplinary Studies. She is a Truman Scholar, a Rangel Scholar and a Gates Millennium Scholar. She also completed an MA in political science at Villanova in May 2014. Starting fall 2014, Jessica will read for the MPhil in Modern Middle East Studies at the University of Oxford as a 2014 Rhodes Scholar. Jessica has interned at the U.S. Embassy in Belgrade and at the State Department office of Near Eastern Affairs. A sophomore walk-on, Jessica was co-captain of Villanova’s 2013-2014 Division I varsity basketball team. She has done extensive volunteer work with Philadelphia’s homeless. Ultimately, she plans to pursue a career in the Foreign Service. Jessica grew up in Lowell, Massachusetts.